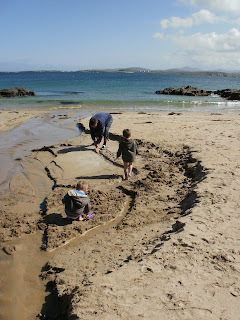 Two small boys, a husband and a renovation project: I take him on holiday and what does he do?! I take him on holiday and what does he do?! We've been on holiday for a week so there's been a lack of blogging on my part but the Mikes have continued to work away in our absence. The extension is now plastered and all we are waiting for is (you guessed it) the electrician to come back! We have given up waiting for him to wire in our hob and oven and Project Manager has wired it up to the old circuit. Unfortunately, this means I can only use one appliance at a time, but it's better than microwaving. It was really depressing coming back to the dust and chaos after a week away to 'forget' about it. Cue tears from me!